Initial findings, from an investigation conducted by Westminster City Council into the ceiling collapse at London’s Apollo Theatre in December 2013, have revealed that aged hessian wadding was to blame for a tragedy that left seventy six people injured. 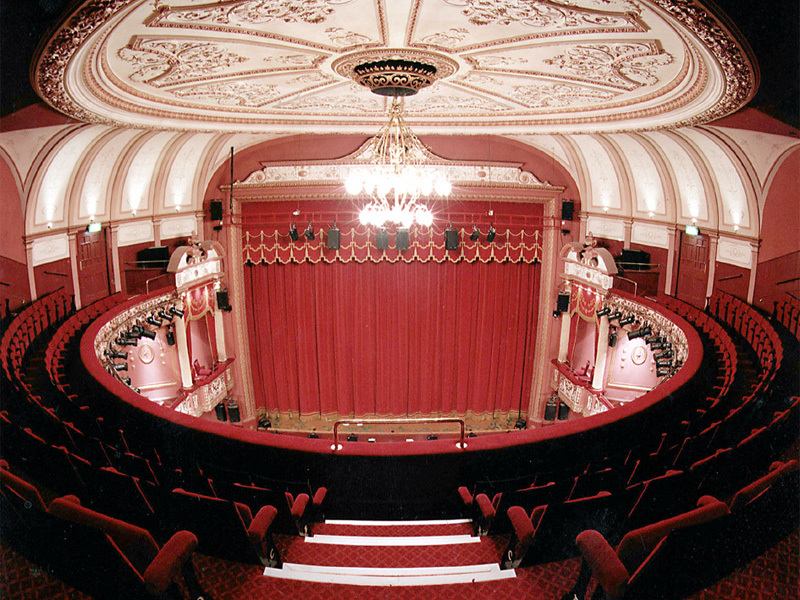 According to two of the UK’s most renowned and award winning specialist plastering experts, the collapse will hopefully lead to improved facility management and vigilance by theatre staff coupled with regular inspections by structural experts. Ronnie Clifford, who founded Yorkshire-based Ornate Interiors in 1989 with brother Iain, has worked on hundreds of the nation’s most prized historic buildings including theatres such as Hammersmith Apollo, Stockport Plaza and Wolverhampton’s Grand Theatre. He explained: “This was a major tragedy that could have been averted with a bit more common sense and an acute awareness of just how sensitive and delicate some plasterwork ceiling constructions, dating back many decades, can be. “This ceiling in question at the Apollo dated back to 1901, where the principal cause was found to be the deterioration of plaster wads that were used to secure the ceiling. However there are a number of preventative measures that theatre owners can take to prevent this happening again. “It’s been my observation, when ceilings have been fixed using plaster wads, that although wadding is very strong and secure, the hessian inside the wad will deteriorate over time whilst the plaster part of the wad remains strong creating, what we refer to as, an “empty egg shell”. “This is why, when requested to re-wad ceilings as part of a restoration process, we wrap tying wire around the fixing frame and through the lathed ribs that strengthens the casts. We then wad with plaster and hessian around the wire. This is done in case the wad fails at which point the tying wire remains in place ensuring a firm fix. 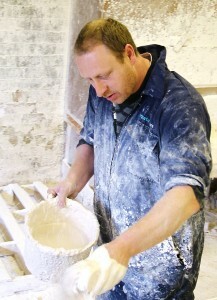 “This is to say we provide additional fixings and don’t rely on the hessian and plaster wads alone. “Another cause of wad deterioration that I have noticed is, when gaining access, other trades and theatre crew walk across the fixing frame standing on top of the wads which causes the wads to weaken. “This was recently evidenced by the craftsmen of Ornate Interiors during their involvement in the recent restoration of ceilings at Hammersmith Apollo where the crew for Joe Cocker assembled their rigging over the Proscenium Arch causing damage to the historic mouldings. “These guys have a job to do and need to do it quickly so have no consideration as to the damage they may be causing.” continued Iain. 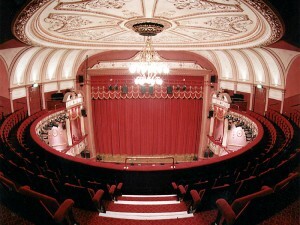 “We also have to bear in mind that todays’ theatre environment is so different from that of 100 years ago with the combination of vibration from the huge sound systems, modern heating systems external traffic and subsidence, these are all factors that couldn’t possibly have been considered during the original planning and construction,” added Iain. Ronnie concluded: “When the public is involved there is a clear duty of care and therefore we urge theatre owners and managers to exercise vigilance. It’s vital the public have the reassurances that inspections are being carried out and the necessary works are being undertaken to avoid further disasters. “It’s about educating as well as understanding the structure of historic buildings and the care required for their maintenance. So advice for owners and managers of these buildings is to ensure the contractors they employ are qualified to undertake the work. Site managers should seek relevant advice before commencing work and replicate this advice for all site visitors and sub-contractors. 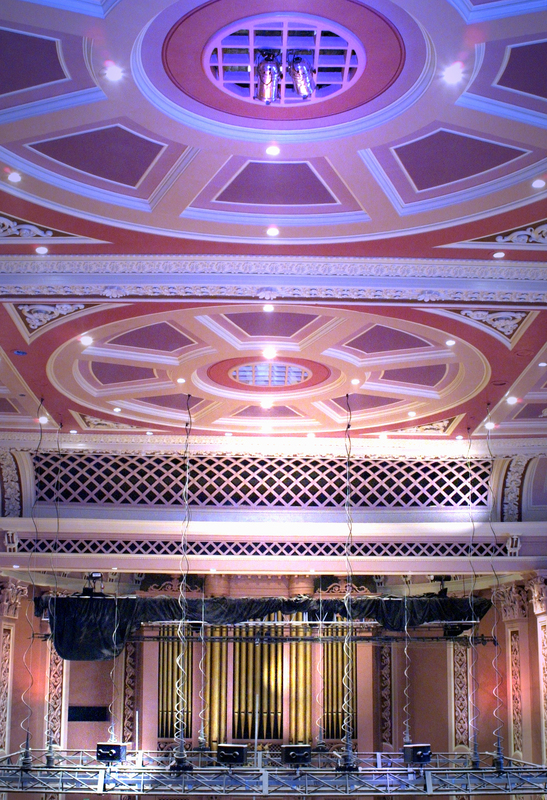 “The Theatres Trust, in its press statement dated March 24th, correctly identified many of the issues including the wide variations in plasterwork ceilings and the need for more rigorous assessments by plasterwork experts and structural engineers. We therefore have to consider that these measures are not just exclusive to theatres but that they should also apply to the many other historic public buildings we have in the UK.,” added Ronnie. Ornate Interiors Ltd carries out traditional lime plastering and manufactures and installs highly decorative fibrous plaster mouldings principally for stately homes, listed buildings, hotels, churches, homes and theatres across the UK, Ireland and mainland Europe. The company also works on behalf of municipal bodies, architects, contractors and surveyors in compiling restoration surveys of buildings that require repairs.